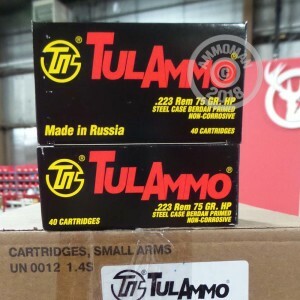 This case of .223 Remington ammunition from Tula is an excellent target load that is particularly useful as a substitute for more expensive match ammo during high volume training sessions. The load and projectile choice will produce recoil and ballistics similar to premium .223 ammo that is normally used for law enforcement duty or long-range competition. Each case contains 1,000 cartridges packaged in boxes of 40. These rounds fire a heavy 75-grain hollow point bullet at a muzzle velocity of 2,750 feet per second. While this ammo doesn't have competition grade accuracy, it is economical to shoot in large quantities so you can put some serious time in honing your skills before the real event. Tula ammunition is loaded in Russia using non-corrosive Berdan primers and steel cases. The cases, while not reloadable, contribute significantly to the reduced cost of this load. Pick up this case or any other items totaling $99 more to get free shipping from AmmoMan.com! Good shooting ammo with no problems. Good ammunition, I hit what I am aiming at with no jams. Comparing it to the more expensive rounds I don't see much difference.